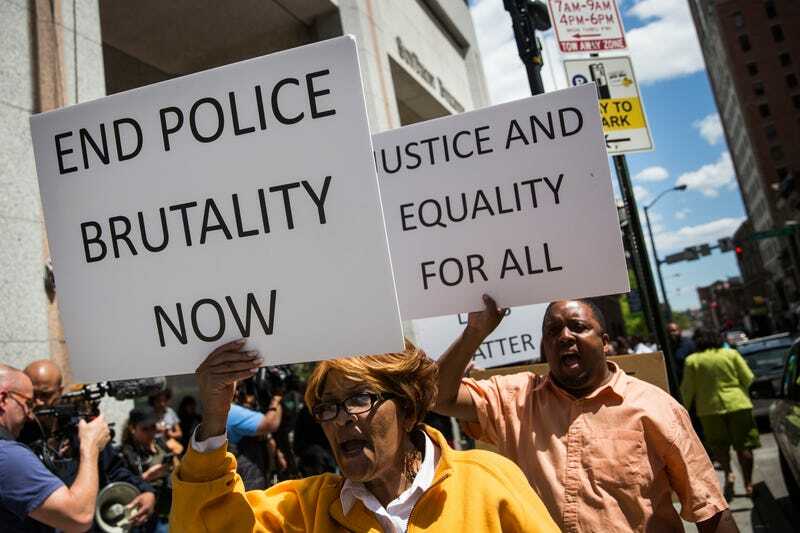 People rally for the family of Freddie Gray outside the Maryland State’s Attorney’s Office April 29, 2015, in Baltimore. Gray, 25, died from a severe spinal cord injury he received while in police custody. The only people who weren’t surprised by the 164-page Department of Justice report on the Baltimore Police Department’s rampant brutality were black residents of Baltimore City whose protests and complaints have fallen on deaf ears for years. Baltimore attorney J. Wyndal Gordon, who has worked to reform the Law Enforcement Officers' Bill of Rights, which obstructs accountability for officers in brutality cases, said the crux of the problems laid out in the report relates to lack of accountability. In fact, current Baltimore Police Commissioner Kevin Davis has had several judgments filed against him and awarded to citizens because he violated their rights. Davis was part of a group of Prince George's County police officers who took a teenager on a drive that led to a federal civil jury awarding the victim, Brian Romjue, a $90,000 judgment. According to testimony by Romjue, Davis slammed his head against a window three or four times. Another officer grabbed him from behind and choked him. An internal investigation by the Police Department found no wrongdoing on the part of the officers. In another lawsuit, a defendant was awarded $12,500 by a jury after a lawsuit alleged that Davis "threw him to the ground and handcuffed him without explanation." The most striking points of the report note that these kind of abuses persisted in public view, unchecked, and subsequently became normalized. Zero tolerance policies instituted in the late 1990s under Mayor Martin O’Malley only exacerbated the problems. Baltimore activists and lawyers note the war on drugs that preceded zero tolerance, as well as Jim Crow laws, also provided the impetus for rampant abuse of power. Countless historic rebellions have begun with a police brutality case. “You say it’s a war on drugs, but they didn’t wage war on the white neighborhoods where they do just as much drugs as they do in black neighborhoods. It was a war on African Americans,” said Gordon. Councilman Brandon M. Scott, who represents the 2nd District and is well-respected by activists in Baltimore, saw the report as a step in the right direction, but emphasized that there are broader problems around the city, including entrenched poverty and lack of resources around schools and recreation centers; issues that need to be addressed concurrently with police reform. Moving forward from the report, Gordon says citizens need to continue to put pressure on the legislature and that the Baltimore Police Department needs to agree to the consent decree to get the ball rolling. “There is healthy skepticism among residents that the DOJ report will do more to create careers, contracts and credibility for white-led institutions than it will do to address the pattern of violations of constitutional rights and human rights abuses,” said the Rev. Brown.